Can a peace law stop wars? by HWPL in their respective time zones. (May 26, 2016, Seoul, Sri Lanka Guardian) On May 25th, 150 students from Saint Anne’s Girls College in Colombo launched Peace Walk to show their supports to the movement of Heavenly Culture, World Peace, Restoration of Light (HWLP), which aims to cease any kinds of war, and protect our children from the threat of conflicts. 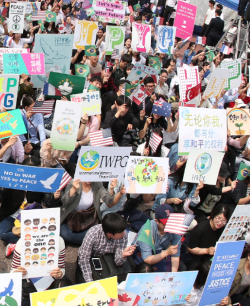 Including this meaningful gathering, youth raises their voice to protect themselves, 300,000 people gathered simultaneously in hundreds of cities including Seoul, New York City, Sydney, and Shanghai for the 3rd Annual Commemoration of the Declaration of World Peace: Legislate Peace Campaign hosted by HWPL in their respective time zones. Filled with vibrant people yearning for peace, the event at the World Peace Gate in Seoul Olympic Park especially captured the eyes of many. This year’s commemoration highlighted the global peace advocacy movement, Legislate Peace Campaign, recently launched to bring all wars to an end by establishing an enforceable law compatible with the Declaration of Peace and Cessation of War (DPCW). The DPCW (Refer to http://peacelaw.org/site/declaration) is unique in that it includes provisions aimed at resolving conflicts, reducing war potential, repurposing weapons to benefit humanity and inviting all citizens to participate in the active promotion of a lasting culture of peace. The Legislate Peace Campaign calls on global citizens to unite as one to voice their positive demand for peace by adding their signatures. According to HWPL, as of May 25th, the collected signatures have exceeded 500,000 from 154 countries in less than two months and many heads of state have written official letters of support for the DPCW. The number of signatures is expected to reach 2,000,000 by the end of this year. of the landslides and floods in Sri Lanka! Especially, at these days events, there were booths installed to fund-raise for countries which were prone to severe natural disasters. 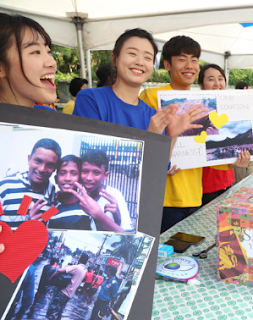 HWPL, IWPG, IPYG, and citizens were continuously putting hands together to help those who are suffering from Sri Lanka flood and a severe outcome caused by earthquakes in Ecuador that happened recently. Heavenly Culture, World Peace, Restoration of Light (HWPL), a UN DPI registered NGO, is an internationally recognised peace organisation. It has pioneered various peace activities including the World Alliance of Religions’ Peace (WARP) Office, as well as held peace education seminars, peace walks, and peace forums with the International Women’s Peace Group (IWPG) and International Peace Youth Group (IPYG).